One champion successfully defended his title and a new king was crowned as UFC 227 unfolded on Saturday night from Los Angeles. 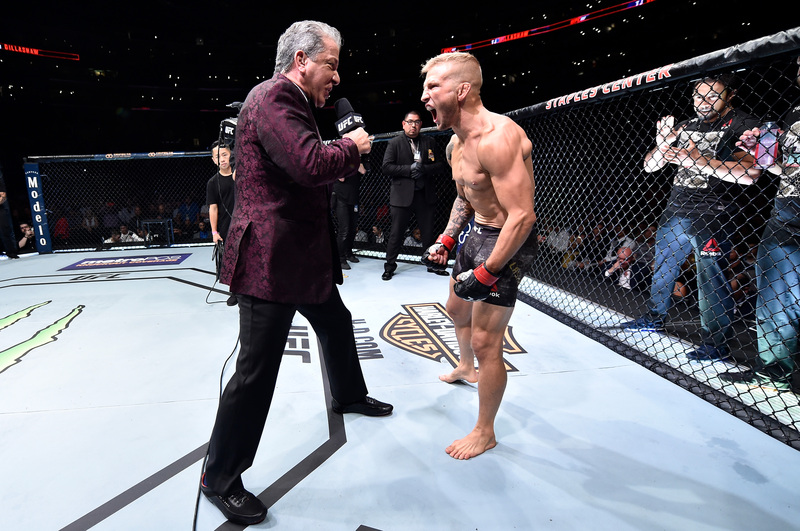 In the main event, TJ Dillashaw slammed the door on his longtime rivalry with former teammate Cody Garbrandt with a stunning first-round KO to hold on to his bantamweight title. Both fighters were definitely gunning for the knockout, but it was Dillashaw who used pinpoint accuracy and a devastating counterstrike to put Garbrandt on wobbly legs midway through the opening round. From there, Dillashaw just poured on the punishment as he unleashed a barrage of strikes that finally put Garbrandt down and out to end the fight. Heading into Saturday night, the main event was as split down the middle as could be, with fantasy players giving a very slight advantage to Dillashaw, with 53 percent favoring him to win. Another 64 percent predicted he would win by knockout, and ultimately all the players who chose Dillashaw earned an extra 150-point bonus because it was a title fight. Meanwhile, in the co-main event, Henry Cejudo shocked the world as he pulled off an upset to take the flyweight title away from defending champion Demetrious Johnson in a back and forth battle over five rounds. Cejudo showed off tremendous improvements from his first fight with Johnson as he used a strong wrestling attack along with great ground control to become only the second flyweight champion in UFC history. As expected, Cejudo was an overwhelming underdog, with just 10 percent of fantasy players picking him to win, and they will enjoy that same 150-point bonus because this was a title fight. Elsewhere on the main card, Renato Moicano made short work of Cub Swanson with a first-round rear naked choke submission. The Brazilian was actually the underdog going into the fight according to fantasy players, with only 38 percent picking him to win. Another upset took place in the women's strawweight division, as JJ Aldrich handed Polyanna Viana a loss by decision after three rounds. Aldrich was selected by just 24 percent of fantasy players as she earns her third win in a row in the UFC. In the opening bout on the main card, Thiago Santos got a decision win over a very game Kevin Holland, with 85 percent of the fantasy players correctly predicting the Brazilian coming out on top. The prelims featured an all-action bout between bantamweight contenders, as Pedro Munhoz was able to earn a unanimous decision victory in an absolute war with Brett Johns over three rounds. Munhoz was a solid favorite going into the fight, with 67 percent of fantasy players picking him to win and another 68 percent predicting that he would get the job done by decision. In one of the tightest matchups on the entire card, Ricky Simon used a superior pressure and grappling game to ground Montel Jackson over three rounds to earn a unanimous decision victory. Simon was a very slight favorite, with 51 percent of fantasy players picking him to get the win. Ricardo Ramos earned a split decision win over Kyung Ho Kang in a close battle in the bantamweight division, as the Brazilian earned his third straight win in the UFC. Ramos definitely had a fight on his hands, but he got the win after 72 percent of fantasy players predicted his victory ahead of the event. Sheymon Moraes also managed to get a unanimous decision against Matt Sayles as one of the bigger favorites on the preliminary card after 72 percent of fantasy players picked him to win. The players who picked Moraes also earned an extra 120 points because the fight was such a tight matchup going into the event. On the early prelims, Alex Perez got a statement win as he punished Jose "Shorty" Torres with a barrage of strikes before finishing the fight by first-round knockout. Perez was favored by 61 percent of fantasy players, while they also earned an extra 120 points because the fight was a tight matchup going into UFC 227. In one of the only upsets on the prelims, newcomer Weili Zhang earned her first UFC victory and 17th win in a row as she slipped past Danielle Taylor over three rounds. Zhang was selected by just 38 percent of fantasy players while her win also earned an extra 40 points because it was her UFC debut. At the end of the night, eight favorites were victorious according to the selections made by fantasy players, with four upsets taking place over 12 fights at UFC 227 from Los Angeles.